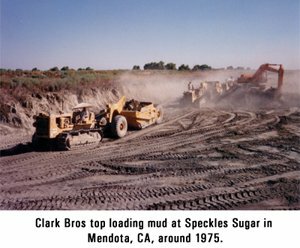 Founded more than 70 years ago by Norman Clark and his two brothers in Dos Palos, California, the original “Clark Brothers” company was organized in the late 1930's and now spans three generations of Clark Brothers in both the construction and farming industries. After Norman's premature death in a plane crash in 1949, his two teenage sons, Allan and Norman, Jr. continued the business of dirt moving and farming. Developing large farming operations in Arizona and California and construction projects of highways, dams and building pads for large warehouses and farm sheds, the new management continued to grow the company. Today under the third generation of Clark Bros. Inc., the company has expanded into all forms of construction, including water, wastewater and filtration facilities, as well as heavy civil work in the renewable energy industry to include contracting for over 1GW of solar power and 600MW of wind power. When Norman arrived at the age of eighteen from Superior, Wisconsin on a train, he found work driving a D-8 pulling a LeTourneau scraper. He soon purchased his own tractor, started his own land leveling business, and invited his brothers to join him in California. When Norman died in 1949, Allan and Norman (Jr.) Clark were still in their teens. 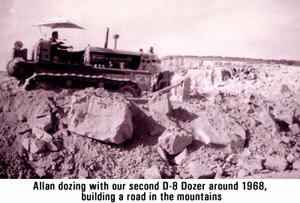 In 1958, faced with a responsibility for their mother and sisters and a company that required a new beginning, they bought a late model D-8 tractor and began leveling land and sub-soiling farm ground, while at the same time taking turns going to college, one semester at a time. They continued leveling land and going to college for 4 years and the company gradually grew as they added more earthmoving equipment. Looking for a way to keep their employees busy year-round, they found a piece of desert ground in Arizona they could buy for nothing down and no payments for five years. Each winter when they were rained out in California, they would take the crew to Arizona and develop what became the 900-acre Harquahala Ranch. Once the Arizona land was developed, they did the same in California, each winter developing a little more of ground which they bought by mortgaging the Arizona property. The farming and the contracting continued to grow together until, in the early 1980's, they were farming 14,000 acres on five different ranches and running one of the largest land leveling companies in the state, leveling approximately 10,000 acres per year. During those years, they had opportunities to do several other types of construction. 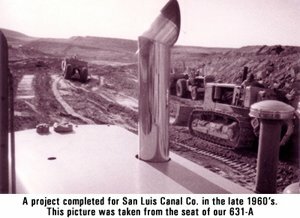 They helped build the Mammoth Pool Dam on the San Joaquin River, the Sly Creek Dam on the Oroville Project, part of the highway between La Grange and Coulterville, early work on the San Luis canal, many canals and dams for farmers, and building pads for packing sheds, warehouses, and more. Allan and Norman Clark celebrated 50 years of partnership in 2008. Now under the leadership of the third generation of Clark Brothers, CBI continues to grow and expand largely because of the help and dedication of long-term talented employees and the many hundreds of loyal customers they have developed over the last 60 years. Today, Clark Bros. Inc. is a well-established and highly regarded construction company with offices in California, Montana and Texas and is licensed in nineteen states and growing.